The Breath-A-Tech Portable Nebuliser is a compact, lightweight and effective nebuliser, ideal for travelling and when outdoors. 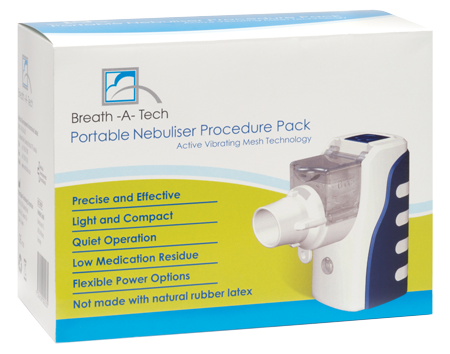 The Breath-A-Tech Portable Nebuliser is recommended for delivering asthma and COPD medication where pMDI and spacer cannot be utilised. 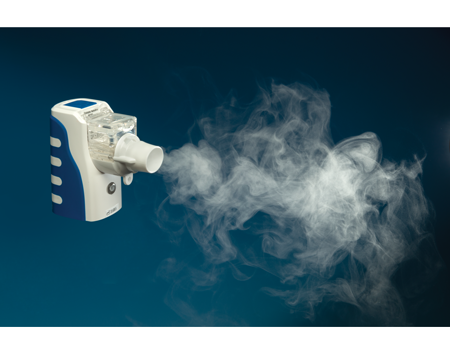 This compact and lightweight device utilises Active Vibrating Mesh Technology that provides quiet, precise and effective nebulisation. This efficient nebuliser is designed to allow minimal medication residue with low power consumption. Flexible power options, either batteries or power adaptor. Ideal for everyday asthma management for patients of all ages. If using batteries, insert batteries. If using power adaptor, connect cable to jack on Portable Nebuliser and plus into an electrical outlet. Attach Medicine Cup, add medication and ensure Medicine Cup cap is closed properly. To begin nebulisation, press ON/OFF button to turn the power on. Place mouthpiece between teeth with lips firmly sealed around the mouthpiece. *If using a mask, firmly attach it to the mouthpiece and place the mask over your mouth and nose. Breathe in and out slowly through your mouth until aerosol formation stops. To end nebulisation, press ON/OFF button to turn the power off. Press release button to remove Medicine Cup. This product may become unusable due to an electrical outage, low battery level or mechanical impact. It is recommended to have spare batteries and a backup device on hand. Always follow basic safety precautions when using electrical products. As with any electrical device, take particular care around children.